Rival biker gangs at a Waco TX restaurant escalated into gunfire this afternoon. The astrology here shows a pretty clear expression of the Bloodbath Formula, mitigated by a tight Mercury-Pallas parallel. Without this aspect, I believe we'd be seeing other similar events as well as higher body counts. 1. Pallas ruler Jupiter quincunx Pluto. 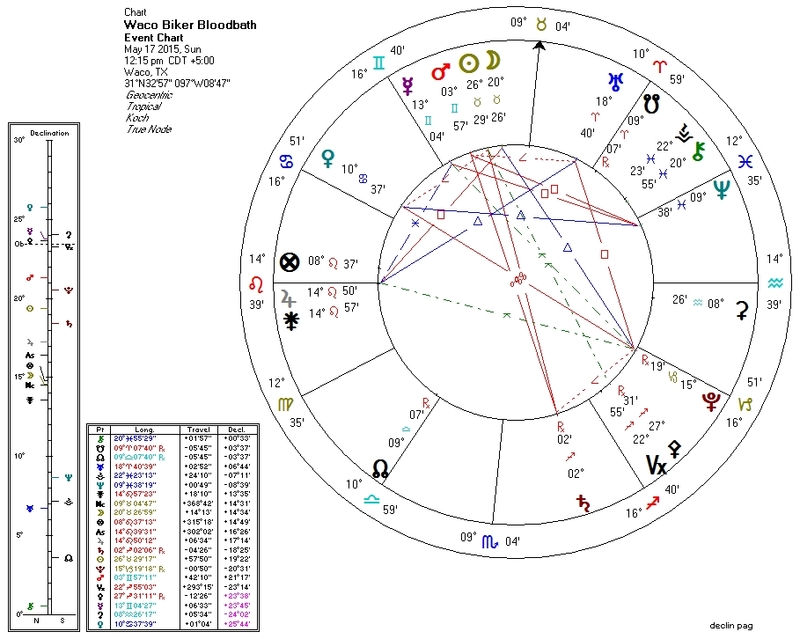 The astro-poetry here involves Jupiter in Leo (identity politics), Venus in Cancer (tribalism elevated in value), Moon conjunct Sun (tribalism again), and Mercury square Neptune (perhaps, confused communications). The Pluto-Uranus-Jupiter triangle suggests identity politics plus power structures (Pluto in Capricorn) plus impulsive action (Uranus in Aries). Actually, this event strikes me as being not inherently different from global politics. When we let the warring tribes get bigger than biker gangs and evolve into nations, however, the collateral damage seems to get exponentially worse. P.S. : This event turns out not to have been a biker brawl gone wrong, but a police massacre!